With a lot of Bud beer moving over the White River Division during the summer more boxcar are required. 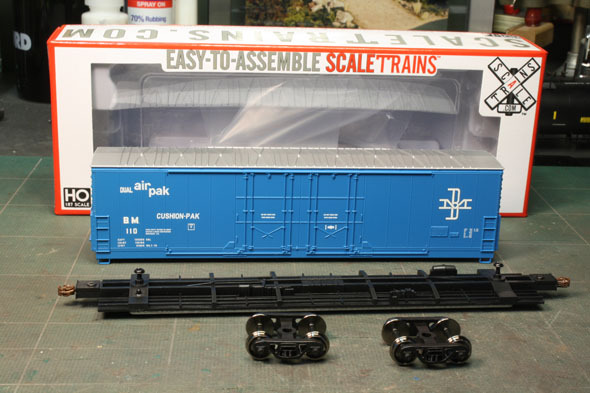 Scale Trains has a nicely lettered “shake the box” kit offered in a few B&M numbers. A nice review of this kit is found in the August 2017 issue of Model Railroad News. This kit is as basic a kit as a kit can be and is reflected in the price. I feel this one is a real bargain. 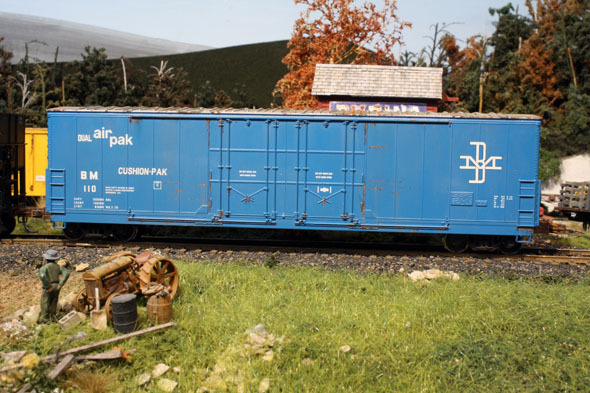 This car has been offered in the past by Details West in 1979, Atlas in 1996 and Athearn in 2004. But for us B&M fans this one comes already lettered B&M with assembly being very basic. One can complete this project in no time at all. On my model although no additional details are added I did spend sometime weathering it up to reflect the look of my White River Division fleet. The paint and power used to weather the under-frame, wheels and couplers. 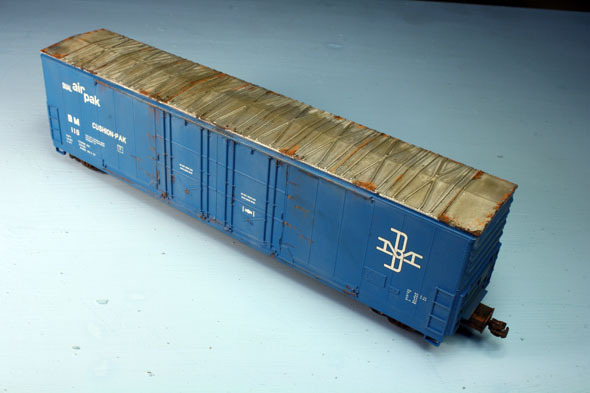 This B&M class RBL insulated boxcar was designated for Bud beer service. These cars were designed to protect cargo from the extreme temperature swings without the use of mechanical refrigeration or heating equipment. The B&M fleet was numbered in the 100-119 series. These cars had a 16-foot twin plug door opening being delivered in 1969 and 1970. The roof got a coat of flat finish followed by a coat of India ink in alcohol. 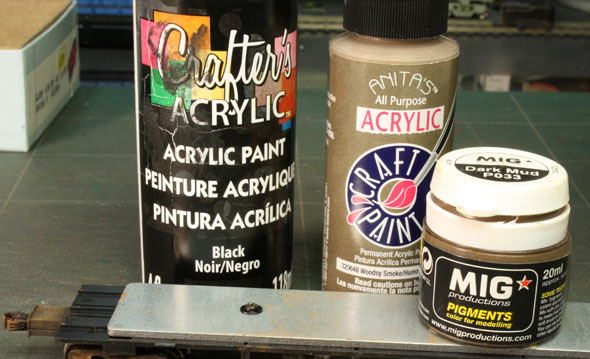 Some acrylic burnt sienna and burnt umber are applied along the edgers. To finish off the roof PanPasels are applied. Being a double door some scratch marks are added on each side. I used Acrylic paint applied with a fine brush making the line by dabbing dots in a line. Once I was finished I found a prototype photo which showed the location of the ACI label which was then applied. At the same time I applied air hoses as I had some available. The Details West tooling was taken over by Athearn, and an important issue is that (like many earlier plastic products) its length was fiddled to accommodate what I believe was a standard mold size and a standard box. 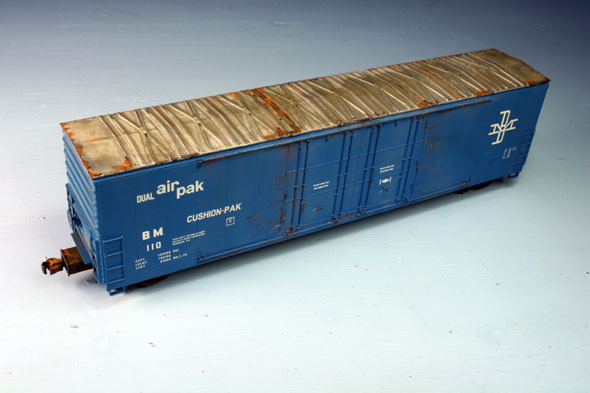 As a result, the Details West-Athearn car is a scale 50 feet, whereas the prototype and the later Atlas car is longer. I assume the ScaleTrains car is also prototype length. While some of these cars may have been meant for beer service, and beer has been a major rail commodity, these cars were more likely to be used in paper product service on the B&M from Berlin, NH. 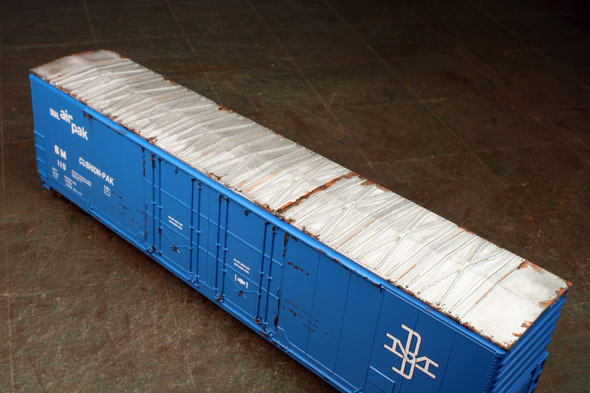 I saw these B&M cars in the 1970s delivering paper products to Sears Roebuck in Los Angeles. The same type was also used extensively in lumber service from Canada to the US. I think the insulation combined with the wide doors were meant to make them suitable for a very wide range of shipments. However, beer definitely did get shipped on the Connecticut River line; a derailment in the 1960s north of WRJ resulted in cartons of six-packs spilling all over and a great rush to "salvage" them by local residents.